Trips that involve a considerable amount of driving mean you will need to stop along the way several times to give your dogs time and space to stretch and relieve themselves. 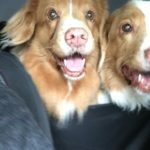 Not all dogs enjoy a car ride so this is especially important for those who experience anxiety in a vehicle. 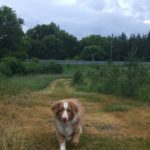 Whenever we are headed on a long-distance journey I search for the municipally-operated off-leash dog parks in the area and make a list on my smart phone or a small notebook with directions. Many cities and towns are creating off-leash parks in conjunction with volunteer community groups to help offset costs. 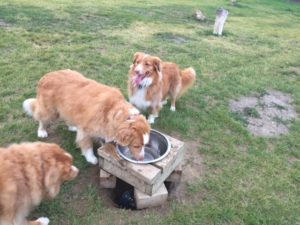 Even the smallest towns are now offering off-leash parks as an alternative since some municipal bylaws allow for enforcement officers to ticket those who are using municipal parks to let their pets run free. Fines for doing so can be as much as $250. 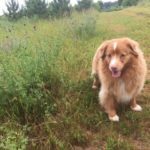 On a recent trip to New Brunswick we discovered an off-leash park in Moncton that even had separate designated spaces for small dogs and large dogs. There were benches for the humans and other trails to enjoy with dogs on leash. 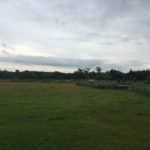 During a trip to Eastern Ontario we discovered the Quinte Dog Park in Belleville. In that same area Potter’s Creek Conservation Area features the Pooch Path located at the corner of Loyalist Wallbridge and Hwy #2. 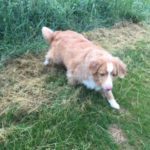 Know your dog’s behaviour around other dogs before venturing into one — if they are not well socialized it could be a potentially unpleasant experience. Your dog should be good with greeting other dogs and playing, especially in very busy urban dog parks. Many dog parks provide plastic poop bags for you to pick up after your dog, but try to remember to take your own just in case. The City of Toronto is currently testing the use of green bins in 20 parks across the city. Dog poop in plastic bags can be placed in the green bins and don’t have to be biodegradable bags. So far, an audit of waste bins located near dog parks showed that 84 per cent was organic waste. 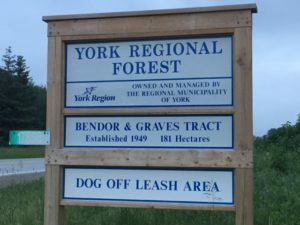 The Bendor and Graves Tract located in Cedar Valley, Ontario near Newmarket is a wonderful fenced, off-leash dog park with surrounding hiking trails. Locally, my favourite dog park for our three Tollers is the Bendor and Graves Tract, part of the York Region Forest Cedar Valley, east of Newmarket. The park has benches for the human traveller and large water bowls that are often full or you can replace with your own — always remember to bring water for you dog on any journey, even the shortest day trip. Dog bowls like this one are provided at many off-leash parks. In this example a hole dug underneath the bowl provided a cool place for one visitor to place their bottle of water which they had left for the next visitor. Admission to all dog parks I have ever visited is free, which is an incredible thing when you think about the joy your dog gets and the comfort you have in knowing they can be free in a safe environment away from roads and places where they perhaps aren’t always welcome. The Bendor and Graves Tract Dog Park is located at McCowan and Davis Drive in York Region and has seating for humans … or dogs! The hiking trail wraps around an old, wide open farm field. The one-hectare, fenced in dog park area is set in the middle of a large field. The east part of the Bendor and Graves trail is a 3.2 km loop trail. The dog park has two gated entries. Bring your own water and pick up after your pooches! There are many large dogs who visit this park. 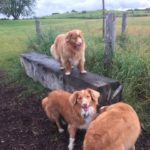 So the next time you are hitting the road, take a few minutes to search the internet for dog parks in the vicinity of where you will be travelling. Even if you have to detour off a highway for a few minutes of peace to stretch legs and take a break it will be worth it for all involved.